Ju-Jitsu Dojo of Columbia FAQ: Will I get a workout training here? 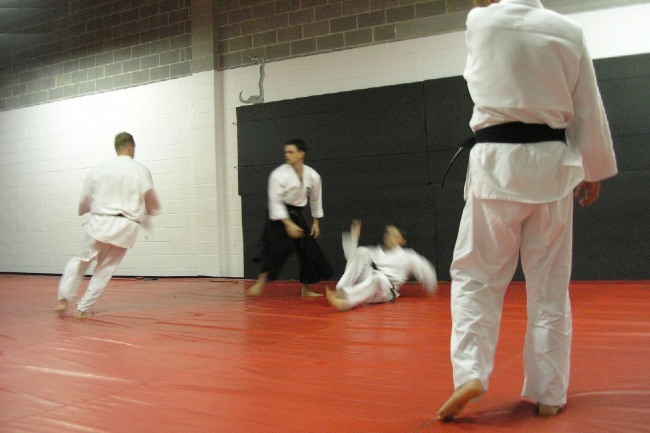 Training at Ju-Jitsu Dojo Columbia provides you with an anaerobic workout, where muscles are used at a high intensity for a short period of time. This means that you can develop stronger muscles and more muscle mass; improve your VO2 max (and thus cardiorespiratory fitness); and because of the way your body changes, your endurance and ability to fight fatigue will improve. Increased muscle mass ultimately makes you leaner and aids in weight management, because muscle uses more calories. While not a workout in the traditional gym sense, training at Ju-Jitsu Dojo of Columbia can be quite a workout. It is a combat situation simulation, with all the stress and intense physical activity such a thing would have. There are no sets or reps as such, but you will be doing techniques over and over again until they are muscle memory. You will be falling down and getting back to your feet A LOT. There is little aerobic training, where you raise your heart rate to 80% of maximum and keep it there for a time, but instead an anaerobic training where you will learn to EXCEED your maximum for a short period of time to overcome an attack. You will also engage in a mental "workout" where you will learn to deal with high levels of psychological stress whilst maintaining a calm situational awareness. If you have not had experience in falling etc., we will teach you how to do so safely, and you will still be able to learn to defend yourself while doing so, since that is our primary goal. The more actively you participate in class, the more of a "workout" you will get. This increases as you advance in rank and practice both attacking in and defending against unscripted attacks from single and multiple attackers - and will increase your conditioning. See, for example, this picture, or go to about the 1:40 mark in our training video, and you'll get a taste of what we mean. See also our blog post on this subject.